Soup can be chunky or smooth, hot or cold, vegetarian or carnivorous—a side dish or the main attraction. 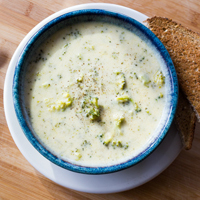 Soup is quite possibly the most versatile dish out there, but not all soups are created equal. Good soup takes time. It requires a few basic cooking skills. But mostly, good soup is made from good ingredients. Boston Organics gives you the time—no more going to the grocery store—and we always bring you the best organic produce from our network of farm partners. So here’s the final missing piece: The Back to Basics Guide to Making Excellent Soup. Whether you’re using onions, scallions, shallots or leeks, you want to give them some extra time to soften up and mellow out. Melt a bit of fat (butter, olive oil, etc.) 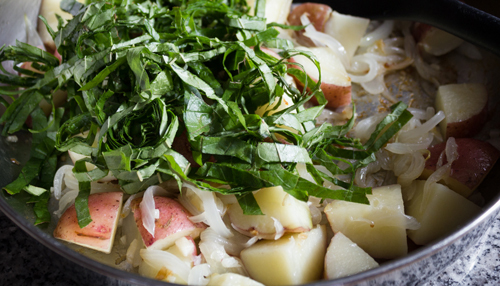 over low heat and add your diced onions to the warm pan, stirring gently to avoid browning. If you’re using them, you’ll next add your garlic, diced carrots and celery. This is the first opportunity to really make your soup pop! 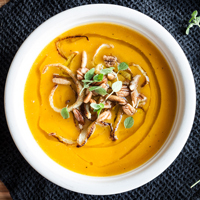 How will you differentiate your butternut squash soup from all the others? By adding just the right mix of herbs. You can stick to the classics: ginger and turmeric or nutmeg and allspice, or kick it up a notch with dried chiles or exotic Indian spices. You’ve got three basic options here: beef, chicken or vegetable. Store-bought options are quick and easy, but you can’t beat the flavors of a homemade stock. Bon Appetit has very simple instructions for making your own chicken stock. It only takes a few minutes of prep time, and then you can let your stock simmer for a few hours while you catch up on Game of Thrones or Gilmore Girls. Time to get creative. One of the reasons that soup is so great is that you can clear all the leftovers out of your fridge and make something delicious. Or maybe you want to highlight something special you got from one of our organic farm partners in your weekly delivery. Hearty root vegetables (potatoes, sweet potatoes, celeriac, carrots, beets, turnips, rutabagas) are the obvious choice. But you can also try mixing in a few apples or pears for some more complex flavors. The key to remember is that everything needs to be cut into bite-sized pieces, and things that take longer to cook should be cut even smaller. Don’t forget about leafy greens too! 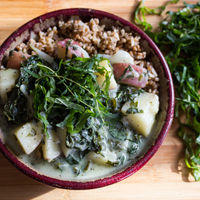 Collards, chard, kale, and calaloo are wonderful additions to consider. Collards may take a bit longer to cook than kale, which can be added closer to the end to keep it from getting soggy and bitter. Step 5: Blend It...Or Not. Another great thing about soup, is that it comes in so many textures. 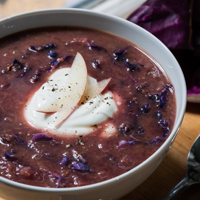 Some parents have been known to puree soups purely to trick their kids into eating vegetables they would otherwise scoff at, but sometimes a velvety smooth soup is desired over a chunkier stew. 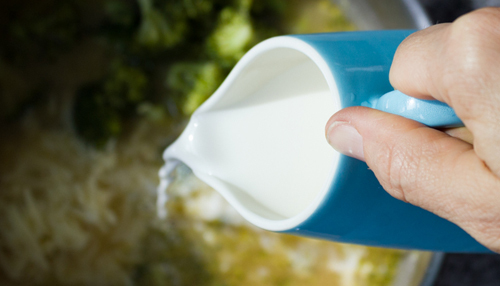 A handheld immersion blender will be your best friend for this step, but you can also puree your soup in a blender or food processor. It’s usually best to do this in batches, closing the lid carefully but leaving extra room for the hot soup to expand as it blends. If your soup is simply a side dish it may not need any protein, but if it aspires to be the headliner you have plenty of choices. Really tender meat in a soup can be exquisite, but vegetarian options abound. Depending on what you choose, this step might come at different times. Beans take longer to cook and should be added with the stock (unless they’re canned and pre-cooked and should therefore be added later). More delicate proteins like tofu can be added towards the very end. They say that presentation is everything. And while that’s not always true, it’s pretty important for soups. 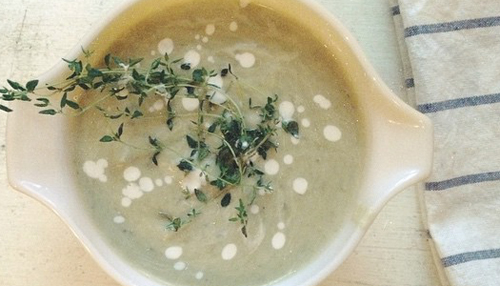 Even the most delicious soup can look like a bowl of slop without the right finishing touches. Grated cheese, cream and yogurt look stunning sprinkled on top, but they can also add a great component to the soup’s flavor profile. Croutons, nuts and tortilla chips can balance out the texture of a fully pureed soup. And nothing says fancy like a sprig of thyme and your favorite fresh herbs! Soup can be a time consuming dish, ideal for a typical weekend dinner. Fortunately, it’s also one of the best leftovers. Make a big batch over the weekend and save the extra to brighten up those dark and dreary winter evenings. 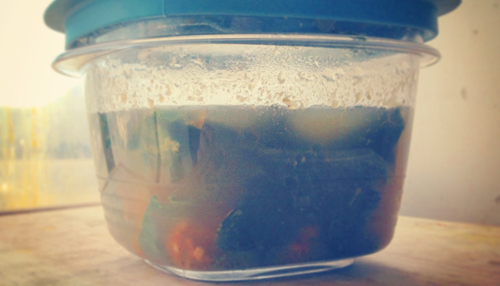 To freeze your soup, pour it into an airtight container, remembering to leave enough room for the soup to expand as it chills. Let it cool to room temperature before sealing. Keep it in your freezer for up to two months. Then, simply reheat it in a saucepan over low heat and add a little extra water or stock to thin it out. - Carelessly cutting the vegetables. Make sure the vegetables are the proper size so they cook at a consistent rate. - Boiling when you should be simmering. Cooking too quickly will dry out your meat and vegetables. - Only salting at the end. Instead, add a little salt with each step. We get it. Making soup can be intimidating and sometimes it’s easier to just follow a recipe. 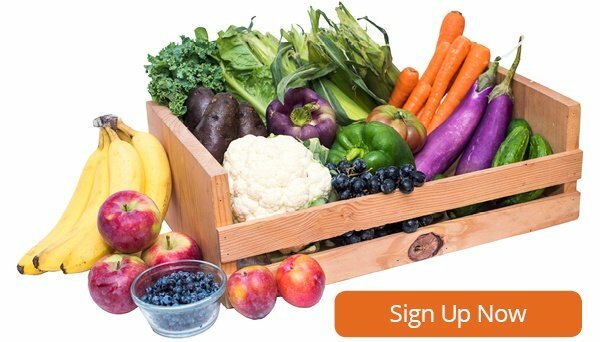 Browse our extensive collection of recipes or just get started with your own produce box! 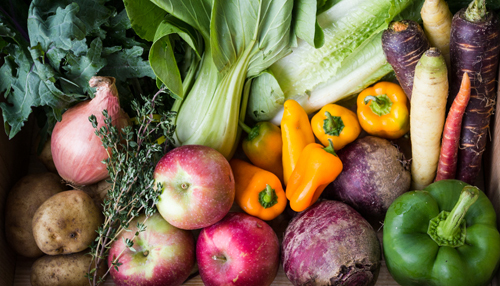 Get fresh, organic fruits and vegetables delivered to your doorstep.